We all want to know how to make our sites better, yes? Attract more readers, subscribers, traffic, sales, ad money? 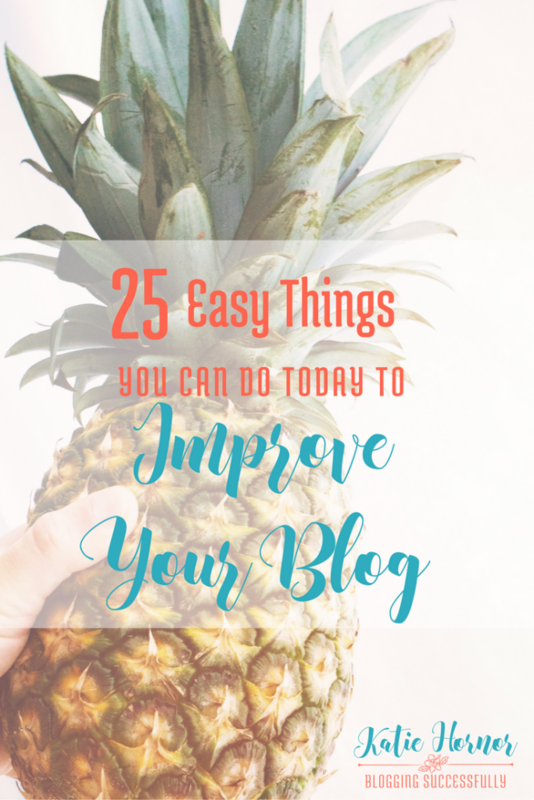 You are welcome to book a Blogging Breakthrough Coaching session any time to get some personalized feedback on your business; but in the meantime, follow this list and you'll be able to tweak 25 easy little things that can make a big difference right now. That way, when you are ready to sit down with a coach, we can concentrate on bigger things. Enjoy! If you use WordPress, update all your plugins every day. Like now. Get a professional head shot, and update your image on your about page, and all social media. Customize your about me page. Make sure your main Categories are in the top menu. Move your affiliate and group buttons from the sidebar to separate page and just create a link for those on sidebar or in the footer. Show off your favorite posts (or most popular posts) with image links in the sidebar. Images get clicked way more often than text links. Some themes will let you do this with a featured post widget. If you need to know how to make images clickable, see this post. Move your “sign up for our newsletter” announcement to the top of the page – one of the first things new visitors see. Or at the bottom of every post, like we have. Make sure to offer a gift or freebie as incentive to sign up for your list. Do a DIY Newsletter Evaluation to optimize and simplify the process for new subscribers. Consider removing or simplifying footer widgets. Don’t let your footer collect your long, unimportant, list-like widgets. Excessive outgoing links in the footer can slow down your site because they have to load with every pageview. Or change them with a pretty link. Remove or change generic text that comes with plugins, email list boxes, or contact forms. Make share buttons easy for people to find at the beginning or end of every post. 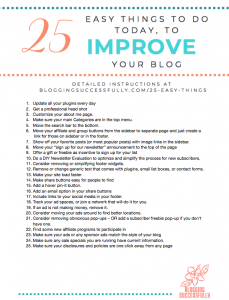 Often, I want to save/share/pin a blog’s image – and sites don’t have the buttons set up for it! Be sure you have a social sharing widget. I love Shareaholic, but there are tons of options. Add a hover pin-it button. I use the free plugin Pinterest “Pin It” Button Lite for this. Add an email option in your share buttons so readers can email the post to themselves or someone else. Include links to your social media somewhere on your home page or footer. I prefer the footer, because once they leave my site and go to social, they may not come back because they'll get distracted. Track your ad spaces, or join a network that will do it for you. I have tried a couple of ad networks, but I am mainly using Adthrive, Amazon CPM ads with a fall-back to Adsense at the moment. If an ad is not making money, remove it. Your blog real estate is precious, and if an ad is not making you money, it needs to go. Consider moving your ads around to find better locations. Consider removing obnoxious pop-ups – or the ads that cover the entire screen in a grey screen. They may make you money – but they could also turn away readers. Evaluate what is more important. And be SURE that your pop-ups are not covering the entire screen on mobil, or you could be visibility limited. OR consider adding a subscriber freebie pop-up if you don't have one. Just don't make it obnoxious. Statistics say the DO work! Find some new affiliate programs to participate in and put some of their ads on your site or in a post. 300×250, 728×90, and 160×60 ads are the best sizes for ads, according to current statistical data. A 728×90 spot in your header widget is a great place for an affiliate ad and because it shows on every page you can sell it based on your total monthly pageviews. Make sure your ads or any sponsor ad spots you sell provide you with pretty images that match the style of your blog, and are not offensive. Make sure any sale specials you are running have current information. For instance, you have a sale in August for 20% off your ebook, but the sale image still says expires May 31st. Hmm. not so good. Make sure your disclosures and policies are one click away from any page. I keep my links for those things in the footer, but you must also include affiliate disclosures in posts and pages, prior to the first affiliate link. Want to take this checklist with you? I'll be happy to send it to you when you enter your info below. You're moments away from receiving this FREE checklist via email. Just tell us where to send it! Stopping by from hiphomeschoolingblog. I’m glad I found you because this post is really informative. my tablet decided to hit send before I was done commenting. I like the part where you offer an incentive to sign up to your mailing list. What are some of your recommendations? I guess if I had an ebook I could do that but I wouldn’t even know where to start. Stacey, thanks for stopping by.